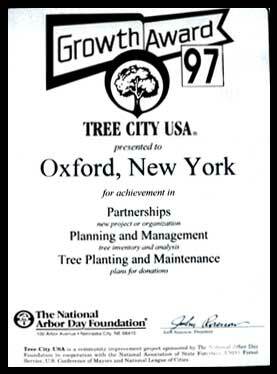 Oxford has been named a "Tree City USA" by the National Arbor Day Foundation since 1993, receiving a leaf each year since, honoring its commitment to its community forest. In 2006, only 117 communities in all of New York State have earned this proud designation, and Oxford was one of them. 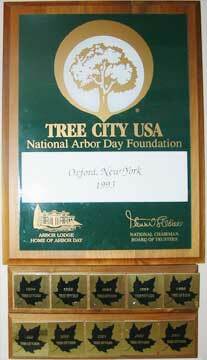 In 1997, Oxford was awarded with the National Arbor Day Foundation "Growth Award". This was achieved with the work of Dale Johnson, the former Oxford High School Agriculture instructor who's also a member of the Oxford Village Tree Board (until 2007). Mr. Johnson had his class inventory all the trees in the Village. His students marked, measured, and typed all the trees, entering the data on computer. It is a great inventory and could potentially be used in a long-term tree study. This huge undertaking was very worthy of the 1997 "Growth Award". 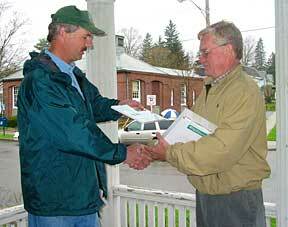 In October 1998 the Village of Oxford received a plaque from the Chenango County Soil and Water Conservation District, for the "Promotion of Forestry in Chenango County". In 2005, Mayor Stark was again presented with the Tree City USA Growth Award for demonstrating progress in its community forestry program for its planning and management, and tree inventory and analysis. It was Dale Johnson's classwork again, enhancing the tree inventory and locating 70+ sites to place new trees. This was the second time Oxford was the proud recipient of this award. The Growth Award recognizes environmental improvement and higher levels of tree care in Tree City USA communities.